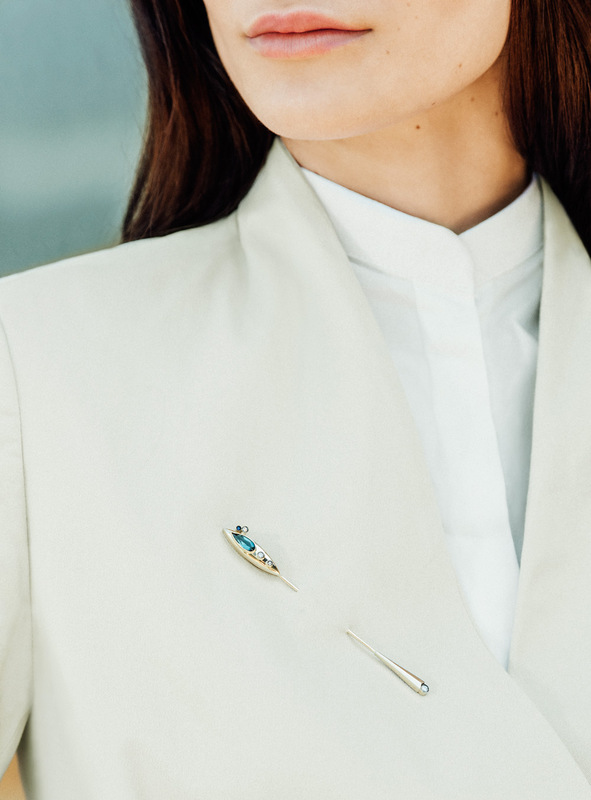 This year, Brazilian fine jewellery designer Andrea Colli has realised the hotel staff uniform badge – not much changed since the 1970s – as a decidedly elegant and precious symbol. As such, her Brazil jewellery studio, Cocoon (see W*177) has created ’Collection Native’ for Brazil’s new hotel Emiliano uniform, designed by Barbara Casasola (see W*212). The trigger for Colli’s design thinking behind the headpiece was the tendency of Brazilian native tribes to embellish the body, routinely in life and also in celebration for special occasions. That organic take is honed by the designer’s sensuous way with gold and an emphasis on linear, organic forms. Then there’s the addition of precious and semi-precious stones – tourmalines, indicolites and sapphires were specifically chosen to offset the Roberto Burle Marx panel behind the hotel reception desk, also chosen for its green and blue colouring. A solitaire diamond at the tail end of the ‘leaf’ stalk imparts an unexpected glint of light.